Should Addenbrooke’s Continue Discriminating on the Basis of Race? Cambridge University Hospitals (CUH) (Addenbrooke’s and the Rosie) have just completed a consultation on their “Single Equality Scheme”. The organisation is due to publish a final scheme, describing its policies on equality and diversity, by May 2009. One element of the CUH’s proposed “action plan” reveals that the hospitals propose continuing with a “Positive Action” scheme which gives advantages to Black or Minority Ethnic (BME) staff over those who do not fit that classification. Such discrimination on the basis of race is currently legal in the UK, where it relates to training people for posts in which their racial group is under-represented. I think this law is wrong and ought be repealed. 14.5% of the total NHS workforce of 1.3 million staff is from BME backgrounds (approximately 192,000 staff) yet only of 1% senior managerial positions in the NHS are from BME groups. I accept this is symptomatic of a problem; I do not agree that the best solution is “positive action” involving discrimination on the basis of race. I see a contradiction between “positive action” for black and ethnic minority individuals and CUH’s commitment to appoint people to roles on merit. I understand the argument that there is no discrimination at the time of selection, but if the positive action policy was not affecting who was eventually appointed then it would be pointless. No statistics relating to CUH’s senior management are provided, though the document does say: “The proportion of the population in the City [Cambridge] from a Black or Minority Ethnic (BME) background has doubled over the last decade to 10.6% … As at 31 March 2008, 15% of Trust staff are from a BME background”. When considering if a positive action scheme is legal, local considerations are not taken into account, what matters is the proportion of people from the targeted group doing that work across Great Britain being low, or zero. If there are none, or a low proportion of a particular racial group doing a certain job then “discriminatory training by certain bodies” is permitted by section 37 of the Race Relations Act 1974. We aim on the programme to give people the confidence, the skills and the expertise that they need and deserve to be able to perform really well at interview for executive director level jobs … It gives them confidence which is key for black and ethnic minority staff. One of the things that we have discovered is that a lot of black and ethnic minority staff do not have the confidence that they should have bearing in mind the level of qualifications that they have and their level of expertise. This suggests to me that the process for selecting individuals for top NHS jobs must be pretty awful if it can be swayed by improving people’s confidence and interview skills. Perhaps it is the selection system which needs changing rather than the attitudes of those applying. Another alternative, which I would prefer to positive discrimination, would be inviting staff of all races to apply for this training in interview skills and “confidence” and allowing those identified as most likely to benefit from it to have access to it. A huge amount of administrative effort appears to be spent in the NHS and in the public sector more generally drafting, consulting on, and writing policies relating to equality and diversity. In Cambridgeshire only last year another element of the NHS, NHS Cambridgeshire, ran its own independent consultation seeking comments on its “Single Equality Policy”. I think there is a huge amount of waste, and misdirected effort which is not leading us towards a meritocratic society. If you are thinking the case for repealing the law permitting this kind of discrimination has not been clearly made here, the case of a trainee museum assistant post based at Brighton’s Royal Pavilion which was advertised by Brighton and Hove Council as only being open to those of African, African-Caribbean, Asian or Chinese descent despite race being irrelevant to the work involved might make the point a little clearer. Just as that advert was wrong and racist, we shouldn’t be allowing racism anywhere else. 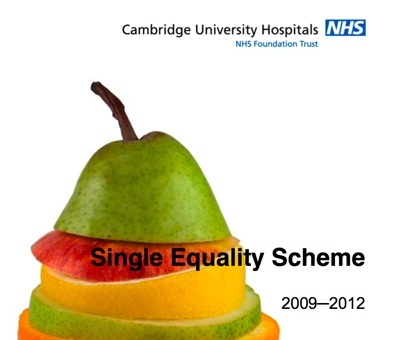 The “Single Equality Scheme” doesn’t address other apparent inequalities at the hospitals, it doesn’t address or comment on the reported fact that the staff are 75% female (readers will be unsurprised by the scheme’s statement that the population of Cambridge is: “approximately equally distributed between males and females”). Medical staff are discussed, but the problems with the UK’s systems for selecting individuals for medical training are not addressed (those with family or other contacts with doctors able to get “work experience” with and references from medical staff are highly advantaged, schemes to make such opportunities more widely available are not open to all). Most shocking is the fact neither the “Single Equality Scheme” or its associated “Action Plan” mentions the word “education”. Education in my view is key to solving health inequalities; Education, at school, college and university is one of the ways people get the sills and qualifications required to work in the NHS. The need for the NHS training scheme suggests the education system is not equipping enough black and minority ethnic individuals with the skills the NHS is looking for, we need to ensure there is equality in the education system too so that in the future we don’t need discriminatory “leadership programmes” for BME staff only. I am not suggesting that those who have not benefited from education early in their life should be denied the opportunity for education and training later, but I am opposed to those opportunities being only made available to particular racial groups. Any opportunities being funded by public money ought be given to those in whom it is judged that the publicly funded training is the best investment for the country irrespective of their race. I was also shocked and appalled recently by Cambridge City Council’s only Green Councillor, Margret Wright, making a speech at a council meeting proposing that the UK ought be run by women, on the basis that men had caused the financial crisis. I also don’t think that there ought be all-women shortlists for party candidates in elections; many of the reasons which may prevent some women from currently getting selected will certainly affect some men so we need to tackle those reasons rather than take a short-cut. This entry was tagged Addenbrooke's, Cambridge on April 15, 2009 by Richard Taylor. I am very concerned about racism by management Staff Bank Office within Addenbrookes. Please would you look at the way that the Zero Hour people are treated in 2018. I am concerned about the managements conduct there. Bulling and harassment of zero contract staff.